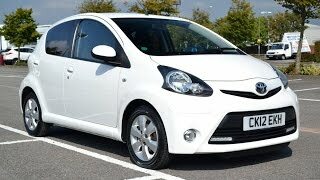 Toyota Aygo gets fresh styling combined with increased efficiency for the MY2012. The 2012 Toyota Aygo features a new, stronger Toyota design execution, a revised interior with new colour schemes, enhanced infotainment connectivity, improvements to ride comfort and cabin quietness, the addition of paddle shift control to MultiMode transmission versions, and a 3 year (or 100,000 km – whichever comes first) pan-European warranty. The AYGO also comes with 12 years corrosion cover. 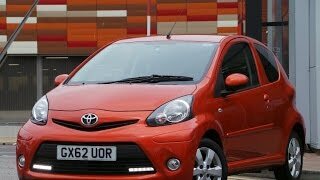 The pricing for the Aygo 2012 starts from £8,590. 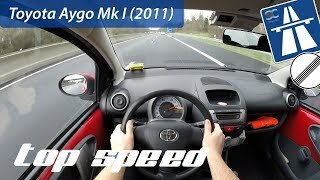 Launched in 2005 at the heart of the growing A-segment, the Toyota AYGO offered Europeans a radical new alternative for stylish urban mobility. Rejecting the commonly held stereotype that compact could only mean pragmatic and economical, the AYGO’s revolutionary design re-defined perceptions of what small could be. Extensively revised at the end of 2008, the Toyota AYGO quickly established a solid reputation in the A-segment for space-efficient packaging, reliability and value for money, with over 580,000 units sold to date. Designed and built in Europe, the new AYGO continues to set the highest standards for interior roominess and driving enjoyment in the compact car segment. It features a new, stronger Toyota design execution, a revised interior with new colour schemes, enhanced infotainment connectivity, improvements to ride comfort and cabin quietness, and the addition of paddle shift control to MultiMode transmission versions. A new, ECO version of the AYGO is available, offering improved fuel efficiency and generating CO2 emissions of just 99 g/km1. 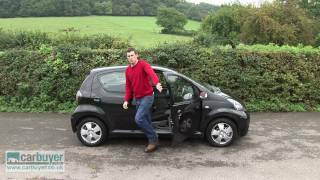 The Toyota AYGO offers customers outstandingly low ownership costs. It achieves excellent insurance classifications in Germany (15) and the UK (3E), which reflect its very reasonable repair costs. It also features a remarkably low cumulative maintenance time of just 5.1 hours after 100,000 km. For added peace of mind, Toyota offers every new AYGO with a 3 year (or 100,000 km – whichever comes first) pan-European warranty. The AYGO also comes with 12 years corrosion cover. Driven by rising fuel prices and increasingly stringent environmental legislation, current downsizing trends suggest that the highly competitive and ever more fragmented A-segment is one of the few areas of the automotive market expected to grow in the coming years. In 2011, Toyota sold more than 85,000 AYGOs. The new AYGO will be on sale throughout Europe from early spring 2012. The new AYGO offers A-segment customers the ideal combination of interior roominess and driving enjoyment in the most compact possible package. At 3,430 mm, the new AYGO is just 15 mm longer than its predecessor. Yet short front and rear overhangs, a long, 2,340 mm wheelbase and a broad overall width of 1,615 mm create a surprisingly spacious, practical interior, whilst giving the AYGO the stable stance, agile handling and small, 4.73 m turning circle essential to urban manoeuvrability. While maintaining the friendliness and sense of fun inherent in the current model’s styling, the new AYGO features a stronger, more dynamic front design. It combines improved aerodynamics and engine cooling with Toyota’s new, Under Priority frontal design language. The distinctive new face of the next generation Toyota family, Under Priority places the design emphasis on an enlarged lower grille to focus attention on the bottom half of the car for a distinctive, more assertive appearance. Housing this large, trapezoidal, radiator air intake, the front bumper has been widened and the new, integral foglamps positioned at the bumper extremities, giving the new AYGO a wide stance and a strong road presence. Set within the lower extremities of the grille, optional LED daytime running lamps complete the new, Under Priority frontal signature of the new AYGO. The new front bumper design also enhances the aerodynamic performance of the new AYGO. The position of the integral front spoiler has been moved forwards by 70 mm and all openings, as well as the front wheel arch periphery, have been shaped to smooth the flow of air into and around the front of the vehicle, improving fuel efficiency. Above a more slender form of the familiar, friendly upper grille, a new bonnet design has been shaped to create greater volume in the middle section, strengthening the new AYGO’s road presence. Privacy glass is available for the rear glazing of both 3- and 5-door versions of the new AYGO, and a new 14” steel wheel cap design is available in addition to the existing 14” 5- and 6-spoke alloys. A choice of eight exterior colours includes two new to the AYGO model range; Vibrant Metallic Orange and Bronze Mica. Due to price sensitivity and low average mileage, petrol currently dominates the A-segment, accounting for 85% of the sales mix. The new AYGO is equipped with Toyota’s remarkable, 3-cylinder, 1.0 litre VVT-i petrol engine. Combining light weight and compact design with the power and torque delivery essential to urban driving, the Euro V compliant engine returns highly competitive fuel consumption figures and generates low, tax-efficient CO2 emissions. A marvel of miniaturisation, the all-aluminium, 3-cylinder, 1.0 litre petrol unit led the trend for powertrain downsizing. To this day, it remains a reference for compact, efficient engineering. At only 67 kg it is one of the lightest units in its class and has won successive Engine of the Year awards in the sub-1.0 litre category. Toyota engineers have worked continuously to improve the performance and fuel efficiency of the engine, whilst lowering emissions with every successive upgrade. This latest version of the 998 cc unit benefits from a revised combustion chamber shape which increases the compression ratio from 10.5 to 11.0:1, improving combustion efficiency. Iridium-tipped spark plugs have also been adopted for their greater durability. Mated to a 5-speed manual transmission, the 3-cylinder VVT-i engine generates 50 kW/ 68 DIN hp at 6,000 rpm and maximum torque of 93 Nm at 3,600 rpm. Fuel consumption has been lowered to 4.4 l/100 km3, and CO2 emissions are just 102 g/km1. A new, ECO version of the AYGO is available for the first time. It is equipped with a longer 3rd gear ratio and fitted with low RRC (Rolling Resistance Coefficient) tyres, which reduce rolling resistance by 14%. This improves fuel efficiency without impairing ride comfort, manoeuvrability or braking performance. Fuel consumption is reduced to 4.3 l/100 km1 and CO2 is lowered to just 99gr/km1. Available as an option on the new AYGO, MultiMode is an automated manual transmission with a fully automatic shift mode and no clutch pedal. It uses computer control to manage the engine, clutch and transaxle for quick, precise shifting. Selecting E (Economy), M (Manual) or R (Reverse) allows the car to ‘creep’ in the manner of a conventional automatic. In E mode, the car makes automatic gear shifts that will maximise fuel economy. Selecting M mode allows the driver to manually change gear via either the gear lever itself or –for the first time on AYGO- with steering wheel-mounted paddle shift switches. When equipped with MultiMode Transmission, the 1.0 VVT-i AYGO returns fuel consumption of 4.5 l/100km1 and generates CO2 emissions of only 104 g/km1. With a lightweight body shell (over 50% of which is fabricated in high tensile steel) and short front and rear overhangs, the new AYGO has been engineered to excel in the urban environment. Speed-sensitive, fuel-efficient, Electric Power Steering (EPS) equips the new AYGO with a very tight, 4.73 metre turning circle, offering customers the ideal combination of agility and manoeuvrability. Providing a perfect balance of ride comfort, stability and go-cart-like handling enjoyment, the new AYGO uses a proven, MacPherson strut front suspension system, and an inverted-V profile torsion beam to the rear, which brings considerable advantages in weight and torsional stiffness. The damping force of both front and rear shock absorbers has been adjusted to promote even greater ride comfort without compromising the car’s dynamic abilities and engaging handling. Building on the comprehensive Noise, Vibration and Harshness (NVH) improvements introduced in the current car, the new AYGO benefits from a revised clutch pre-damper system to reduce noise and vibration from the drive line. The addition of a high density bonnet insulator -located to provide an air space between the bonnet panels- reduces the transmission of noise from the engine bay, further improving cabin quietness.